of Santee and other Rebels. Greene's Take: Santee started his first season at UNLV strong but faded away as it progressed, and now needs to not only re-discover his aggression from early last year, but make it last throughout his senior campaign. Santee doesn't have great offensive range, but he has a wide array of moves with the ball in the paint and is arguably the Rebels' most athletic big man. He's going to have to provide senior leadership by example, as he's not a very outspoken person by nature. 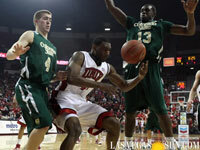 UNLV CAREER: Santee begins his second season as a Runnin' Rebel in 2009-10 ... transferred to UNLV from Midland (Texas) College prior to the 2008-09 season. JUNIOR (2009-10): Played in 30 games and made 21 starts ... averaged 5.3 points and 2.6 rebounds per game ... second on the team with 16 blocks ... shot 52.2 percent from the field and 54.3 percent from the free-throw line ... scored in double figures five times ... led the team with a career-high 21 points in a road win at Fresno State ... pulled down a career-high seven rebounds and added seven points against Cal ... had a string of three consecutive games reaching doubles figures, scoring 10 points at Colorado State and against Wyoming, and then ended the streak with 11 at BYU ... earned Academic All-Mountain West Conference honors. JUNIOR COLLEGE: A 2008 graduate of Midland (Texas) College ... team won the 2007 NJCAA national championship with a record of 29-8 ... averaged 8.5 points and 4.0 rebounds per game his freshman season ... as a sophomore in 2007-08, he averaged 14.0 points per game and his team won the conference championship ... was named the team's offensive player of the year and first team all-conference ... coached by Grant McCasland ... was a top-40 prospect by JucoJunction and Rivals. HIGH SCHOOL: A 2006 graduate of Thurgood Marshall High School in Missouri City, Texas ... led the Buffaloes to a 26-4 record as a senior ... was a three-year varsity letterman for coach Gary Nichols ... named second team All-Houston, his team's MVP and a McDonald's nominee. PERSONAL: Darris T. Santee was born Dec. 10, 1987, in Houston, Texas ... the son of Carolyn Williams and Clyde Santee ... majoring in university studies ... has four brothers, Deandre Santee (20), Clyde Santee (16), Denzil Santee (9) and Nate Bray (23) ... his cousin Cedric Palmer played at Eastern New Mexico and was inducted to its Hall of Fame.